You ever mentally compose a post over the course of a couple of days, taking pictures to go with it, only to have something happen that just blows all that away? Did I knit this weekend? Yup. Did I do something to further prove that I’m a geek? You betcha. I have pictures of both. Yay me. Except you’ll have to wait until tomorrow to learn more about those things. What happened you ask? The twins. Kathryn and Alexander. They happened. Last week you’ll remember that my mother reported that Alex had escaped from his crib during nap at her house. This was after the pair of them escaped from the Pack ‘n Plays last weekend at my sister’s house. Well they lulled me into a false sense of security. After staying in the cribs Friday morning, I decided to leave the sides as is and not convert them quite yet to toddlers beds. They only served to enforce this decision on Saturday when they stayed in and played for at least a half hour before I plucked them out for breakfast. Later they took a 3+ hour nap and didn’t escape at all. Nor did they escape Sunday morning or after the brief after lunch nap they took. Lulled I say. Oy vey. They both escaped. They found a long forgotten box of corn starch (used for a particularly bad diaper rash Kat had) and went to town.nbsp; Kat was dancing in it declaring the place a "mesh". She looks particularly pleased with herself doesn’t she? The floor and just about everything else in the room, kids included, had a good coating of corn starch that seemingly took forever to get up. Heck, I had to vacuum my vacuum. If Kat wasn’t dancing, she laid down and told me "night-night" After vacuuming forever, the three of us were pretty well covered in the stuff and went off to the shower. At least I didn’t have to give them an after dinner bath for a change. Their floor still has a nice silky feel to it. I’ll have to swiffer it later and I suspect I’ll be dealing with the aftereffects for a long time to come. That’s the kind of afternoon I could pass on. There is a bright side, at least it wasn’t the large and expensive tub of Triple Paste that they made a mess with. Now comes the hard decision of what to do with the beasts. Obviously the cribs are no containment structures anymore. I do have one little problem though. While Kat’s crib is a true convertible to toddler bed complete with a little half rail to keep her from falling out, the same is not true of Alex’s. I can take the side off, but I don’t have a rail for him. I don’t think he’s ready to sleep without the rails yet as he presses against the sides still. I’m tempted to leave the side on and leave them in the open position. They won’t roll out, but yet if they do want to escape and fall, they’ll fall from a much lower position. Or do I just bite the bullet and go get two twins beds and the guardrails to keep them from falling out. Help!!! I’m really, really not as mean as this sounds, but omg is that picture of Kat standing up covered in starch absolutely hysterical. My condolences on the breakout and subsequent ‘mesh’ – I’m sure someone with more twin-knowledge than me will have some good ideas. Ohboyohboyohboy! Is it wrong of me to find those pictures so funny?? So much extra work for you, and yet . . . oh my! Kat really does look quite pleased with herself! And Alex is looking very, “It wasn’t me!” innocent, sitting in that chair. Oh! Oh! Oh!! Wow. That certainly is a “mesh.” (But the pics are adorable!) 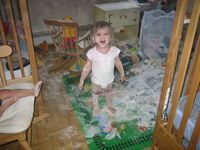 My oldest got into a tube of A&D when she was about that age, and I never did get the grease stains out of her bedding! As for the beds, I think you’re okay using the cribs with the rails down. Or you could put their crib mattresses on the floor and let them try sleeping on them that way (they make great trampolines! )until you are ready to buy twin beds. Oh, Risa! Great pics — you must keep the pics to embarrass the twins with later on in life! Mattresses on the floor sound perfect, Katy! Wish my parents’d let me sleep on the floor (they kept picking me up and putting me on the bed ). Just guess the twins’ room’ll have to be toddler proofed first…. Oh, I do so love being able to laugh about this stuff instead of having to clean it up!! Forgive me! I do sympathize but mostly I’m just gonna sit back and enjoy cause they ain’t mine! Risa, you can buy the bed rail separately for Alex’s bed. Google for toddler bed rail. Great future blackmail photos. Wow! My little one never escaped. I don’t know why he just never did. I’ve seen mesh (not mess) tents that go over cribs that are supposed to stop the wee ones from climbing out. Hahahahaaaa……I’m sorry, but that is just priceless!!! 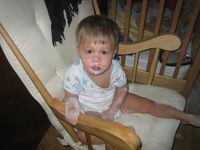 I remember one of my kids getting into a jar of vaseline….now that was nasty! I imagine if you just lower the sides of the cribs, they will be able to get out without getting hurt. I bet that they do make guard rails for toddler beds too. Now I know why having children is for when you are younger….hehe. Oh boy. I refuse to laugh because if I do I know my kid will be next. How long did it take to get all of that cleaned up? OMG, it’s all already been said but thank you so much for the chuckle. Yesterday, I was quite weepy as I deposited my oldest at college but reading your post has put me back in my place. I’m sorry to laugh at your predicament but dang, those kids are simply adorable. I do hope you frame those shots!! Great shots! Thank you for sharing. I’m glad it wasn’t mine. Risa, what a scrapbooking moment you have there. The 2 of them sure had fun. I just giggled, out loud, for the first time in awhile. Kathryn certainly had it right – mesh is correct! Kudos to you for backing out and getting the pictures – they are perfect (look at that grin!) and will be treasured later on. Thanks for sharing. Oh lordy loo. No noises from the baby monitor? That’s called Random Acts of Silence. I’m sorry your security phase is over. Mine were climbing out of their cribs before they could walk, lol, so I never got the security part, but yeah, not so fun. I had them in twin beds at 15 months with no problems (the occasional roll-out of bed but sometimes they didn’t even wake up!). No problems except the problem of twin toddlers alone in a room together. Yeah, no problem… 🙂 Hang in there, though. This too shall pass. Threats now actually work, grin.